Over the years, Christmas has become an advertising playground. They have slowly shifted the attention of the world from its true meaning into a fiesta of ads for toys, movies, clothes, food so much so that Christmas has now become this chaotic whirlwind of parties and shopping but behind the laughter and the smiles — do we really remember what Christmas is about? When you start stripping off all the trappings of Christmas — the gifts, the tree, the parties, the food, the clothes, the mythical figures . . . And you return to the very core and very beginning of the reason why we celebrate this day we will find that there is more reason to celebrate even without all the trappings. 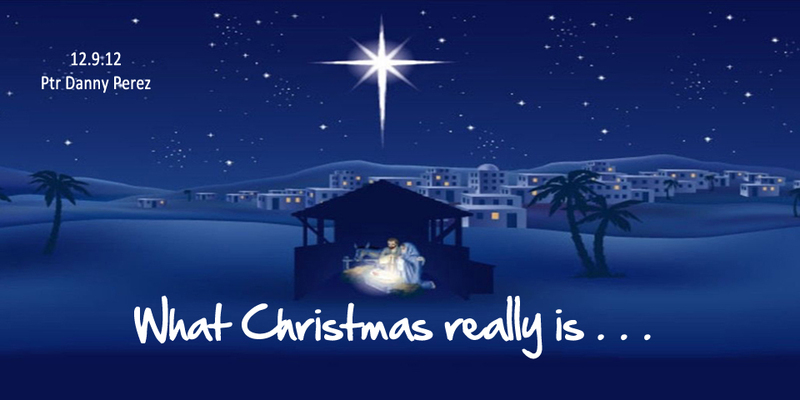 In Matthew 1:18 to 2:4, is the story of Christmas where we see the four titles of Christ: Jesus, Immanuel, King, and Messiah. Daily we find ourselves worrying about loneliness, pain, sadness, depression and trials but often forget that there is one thing that should worry us above all these — the penalty for our sins. Because of our sins, we are candidates for eternal damnation. In the Jewish tradition, they would spend one whole day to atone for their sins—the day of Yom Keppier (day of Atonement), this is described in Leviticus 6. But on Christmas day, 2000 years ago God changed all that when He sent us His Son to be the perfect sacrificed offering that would deliver us from eternal death and hell. That is our salvation in the name of Jesus. Immanuel is the Christ who has lived with us, the Christ who took human form in order to experience what we experience — pain, betrayal, sorrow, rejection — when we cry out to Him in our moment of hurt and confusion, He can understand and can sympathize with how we feel . . . Because He knows how it feels. Immanuel is the Christ who understands our human nature. He understands our struggles, our temptations, our fears. We can find comfort in this. We can find mercy and sympathy in the name of Immanuel. Christ is the King of kings — but have we made Him King over us? Or do we present to Him other kings we have in our lives? Do we have other lords in our lives? We can find reassurance in the King-ship of Jesus. His king-ship reminds us that He has power and control over all things in our life. Over all our trials, confusions, hurts and pains. His king-ship reminds us that there will be a time when there will be no more weeping and wailing because He is reigning over the world. Messiah is the source of our life. He is the original source of life. This is the reason why Jesus came — to give us life. To save us from sin and give us new life and share eternity with Him. We can find hope in our Messiah. Even though we cannot see a clear path before us, even though we think our life has no direction — all we really have to do is to look to Him, to surrender to Him, to depend on Him and He will help us find our way home to Him. The sad thing about being trapped in the frivolities of Christmas today is that we lose God’s presence and message of love — drowned in a sea of parties and shopping — all of which are fleeting joys whereas God’s message of Jesus Christ being born is a cause of eternal joy and comfort, a source of encouragement and hope as we continue to journey this life. Christmas is really God’s presence, God’s power, God’s grace to make the dead live; to make the fallen, rise; to given the condemned forgiveness; to give the hurting, healing; to give the troubled peace; and to give the desperate, hope. God became man as our Jesus, our Immanuel, our King and our Messiah. . . To save us from eternal death, to be with us and understand our human nature, to have remind us of His power and rule and to give us new life and hope. But we can only experience this if we claim it and if we make it real in our lives by believing and receiving God as our personal Jesus, as our Immanuel, as our King and as our Messiah.